2 x KORG Vintage DDM110 and DDM220....for sale! Both drum machines function as they should and are in excellent condition. They come with both instruction manuals and will be shipped in the original Korg DDM-110 box and dispatched as soon as payment by Paypal has cleared. 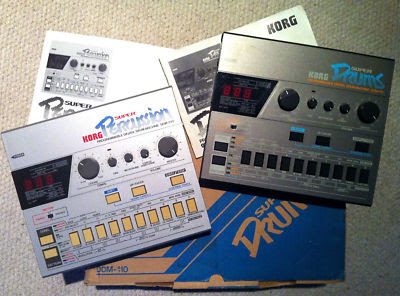 In 1985 Korg released the DDM-110 (Super Drums) and the DDM-220 (SuperPercussion). The Korg DDM-110 uses8-bit sampled drum sounds which include kick, snare, hi/low toms,rimshot, handclap, cymbal, open and closed hi-hats. The Korg DDM-220 accompanies the DDM-110 'drumkit' unit and provides latin percussion samples which sync to the DDM-110 with a DIN cable. CLICK HERE TO BID ON THESE ITEMS! LINN Electronics LM1, the 1st ever....for sale!!! 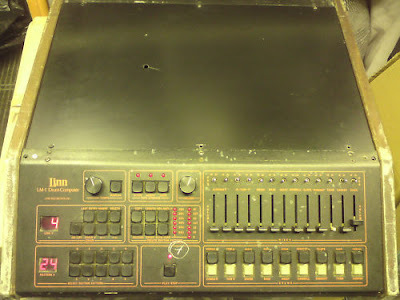 Linn Electronics LM-1 Drum Computer. It is the very first model ever made by Roger Linn and has a serial number 00461 (0nly 500 were made). Unit was tested and plays sequences (sometimes just bleeps), though it's very intermittent-it fails to load sounds, sometimes will freeze etc. Servicing is required to get it to its original working condition though we think that it may be that it's just the tape that needs changing (plus a general clean-up). Needless to say it's a pre-1982 historic piece and very collectable! Unit is sold as it is. 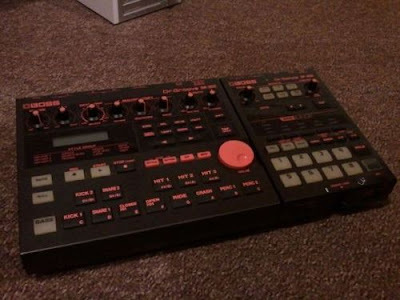 BOSS Roland Dr 202 + Sp202 sampler...for sale! 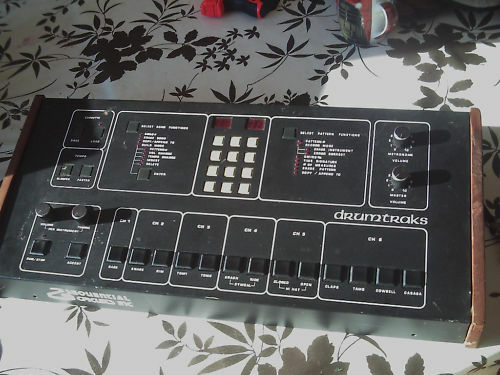 Drum Machine In excellent condition with power adaptor. Sampler unfortunately does not have adaptor but a basic 9v will fit. Sampler input RCAs are occasionally temperamental but fine most of the time. Both have a wonderful gritty lo fi sound and have only had home use. 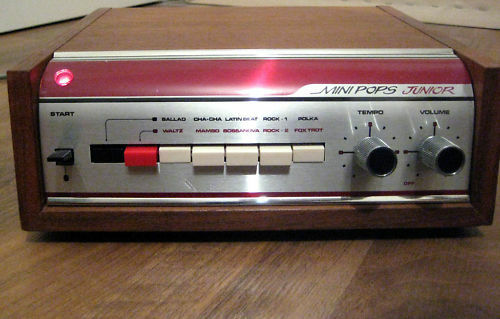 KORG minipops junior Analog Drumcomputer CR78...for sale! wonderfull machine for sale! go buy it its a must! CLICK HERE TO BID ON THIS VINTAGE ITEM! A TINY movie about old drum machines! 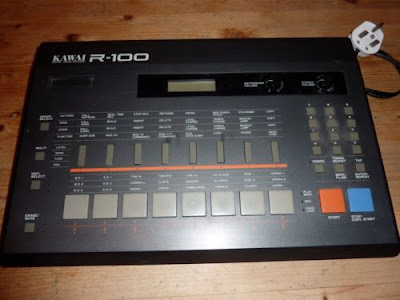 love or hate ole Moby when it comes to drum machines...he has a huge one...erm...collection of old drum machines...that is! 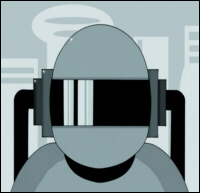 watch & enjoy drum machine dudes! Great little youtube demo...more from the MAN himself! 'Here's a demo of my lovely EKO RITMO 12 Drum machine. Enjoy !!! 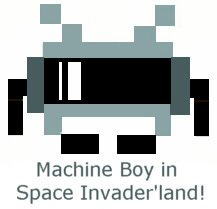 this video has also appeared on the mighty Matrixsynth! Upgrade Options : Cartridge Slot for roland type 64 cartridges. Having a loft clearout and came across some of my old home studio kit. 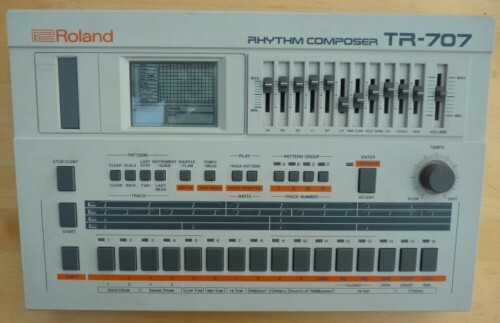 This is a Roland TR707 in superb condition. 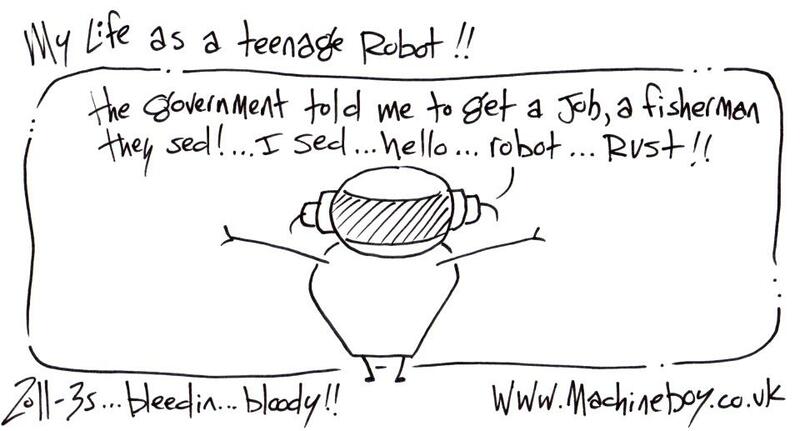 It was working fine the last time I used it (some time in the 1980's! ), although I don't have the means to test it now, so it's bought as seen. Note that it includes the manual, but regretfully the power supply is missing (although it should be easy to replace - you just need a 12V DC power brick). Having a loft clearout and came across some of my old home studio kit. 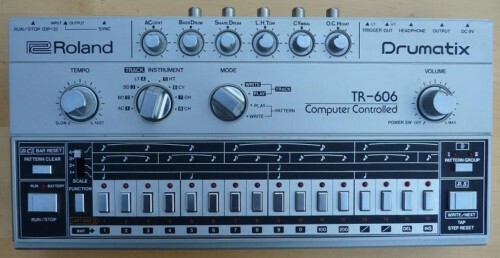 This is a Roland TR606 in superb condition, professionally modified to add individual outputs (on phono connectors). It was working fine the last time I used it (some time in the 1980's! ), although I don't have the means to test it now, so it's bought as seen. Note that the power supply, manual and carry case are missing. If you're outside the UK I'm happy to arrange overseas shipping - but do contact me for a price before you bid. 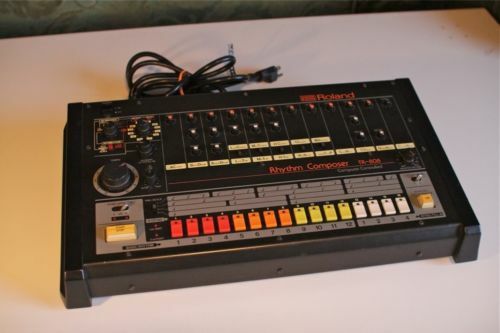 This auction is for a very clean Roland TR-808 Drum Machine. It is only missing one orange knob cap (on CH) and the Low Tom volume pot is a little bit noisy. I haven't tried using DeOxit on the pot but it might clean up easily. 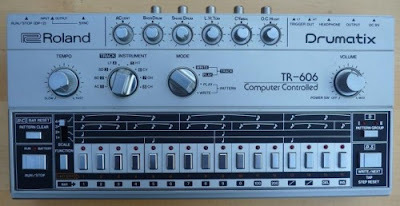 Otherwise it looks and works really well, syncs tight and sounds like an 808 should - funky and ballsy! This device will be shipped boxed very safely by an individual with a passion for musical electronics - not by a shipping depot employee. This item is sold as-is, but has been tested prior to listing and found to be working without problems.